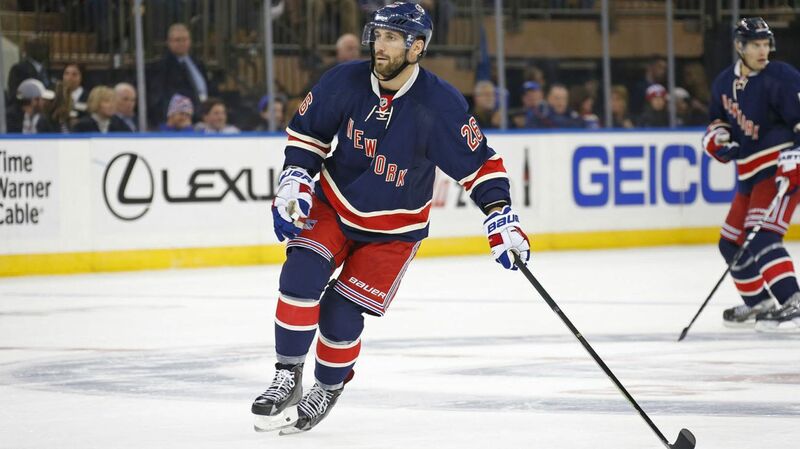 BREAKING: Rangers place Jarret Stoll on waivers, more moves to come? UPDATE: AV said that Girardi has swelling in his knee and will not play tomorrow. A defenseman will be recalled. It would be Diaz but he is injured so expect Skjei. John Shannon of Sportsnet reported on Twitter today that the New York Rangers have placed center Jarret Stoll on waivers. If he clears, he will report to Hartford. NYR place Jarret Stoll on waivers. Jarret Stoll was a healthy scratch in Calgary on Saturday, with Tanner Glass playing a prominent role on the fourth line since he was recalled. Stoll had appeared in 29 games this season, recording one goal and an assist. Stoll had not been all that effective this season on the fourth line. From the start of the season, he saw all of his numbers outside of faceoff percentage take a hit. His corsi was bad (38.6%), he wasn’t scoring and he was lackluster on the forecheck. The Rangers also don’t need his faceoff expertise. With Derick Brassards improvement at the dot, that gives the Rangers three centers with a faceoff win percentage of 50% or better (Moore, Brassard, Lindberg). The good thing about this move is that the entirety of Stoll’s contract ($800k) can be buried in the AHL. That gives the Rangers $1,354,443 in cap space to work with. His placement on waivers is likely indicative of another roster move. Rangers available cap space will jump to $1,354,443 tomorrow (assuming Stoll is no longer on roster, which seems evident). Skjei is $925k. The first thought that comes to mind is calling a defenseman. Perhaps a young defenseman. Who impressed in training camp and has a last name doesn’t look like it sounds. Yes, I’m talking about Brady Skjei, the 21 year old defenseman out of the University of Minnesota. He was the 28th overall selection in the 2012 draft, and has been playing with the Hartford Wolf Pack this season, posting 11 points (2-9-11) in 29 games. He’s believed by many to be NHL ready right now, and the team could use some defensive reinforcements. Dan Girardi is clearly bruised and battered a bit. He needs a break and he needs to rest. He’s also been pretty bad, so it would be nice to try someone else out and give Skjei a chance. Skjei’s cap hit is $925k. This could be a cap clearing move to make a trade or call up a different spare forward, but it’s all speculation as of right now. For updates and more news, keep checking The Ranger Zone and follow on Facebook and Twitter. Posted on December 14, 2015, in Rangers Updates and tagged Alain Vigneault, Brady Skjei, Glen Sather, Hartford Wolf Pack, Jarret Stoll, Jeff Gorton, New York Rangers, New York Rangers blog, NHL Rumors, NHL Trade Rumors, NHL Trades, NYR, Rangers, Rangers blog, Stoll waivers. Bookmark the permalink. 2 Comments. totaaly agree! well done article!!!!! !